Greeneville Woman's Club is affiliated with the General Federation of Women's Clubs, and is the only woman's club in Greeneville and Greene County which is so affiliated. This affiliation provides us with a structured plan for club projects and areas of emphasis. GFWC clubs are organized into six areas of emphasis: Arts, Conservation, Education, Home Life, Public Affairs, and International Affairs. Within these general areas, our club chooses projects to sponsor in order to benefit local charities, educational programs, health organizations, and so forth. 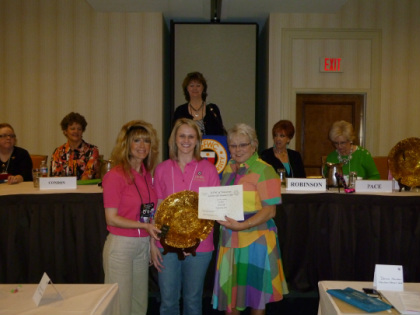 Erin Stayton, club president (center), accepts the award for Outstanding Club in Tennessee for 2012 from Sandy Lindemann (right), president of GFWC of Tennessee, and Candace Turnham, Director of Junior Clubs (left). 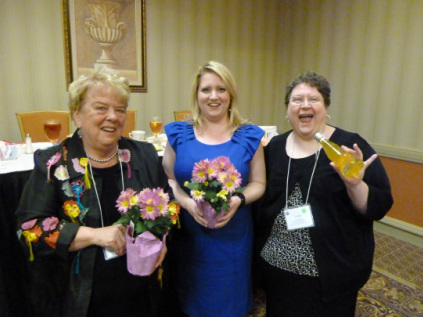 Ann VanBuskirk, Brandy Burnette, and Vivian Gibbons celebrate at State meeting!